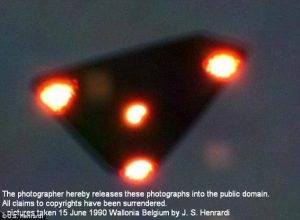 With the exception of “lights,” the most common form of UFO reported by eyewitnesses are triangle or triangular-like flying objects. The classic “flying saucer” or “disk” shaped UFOs don’t come close to the number of triangular UFO reported. That’s according to a survey conducted of 87,000 sighting reports since 1994 collected by the National UFO Reporting Center. The count was conducted by Peter Davenport, the UFO Reporting Center’s director. He found 11,000 reports of triangular UFOs and 6,460 that were shaped liked disks. 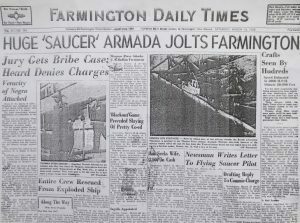 In fact, even the very first modern report of flying saucers were not flying saucers. On June 24, 1947, private pilot Kenneth Arnold was flying near Mount Rainier when he spotted nine objects which he described as, “something like a pie plate that was cut in half with a sort of a convex triangle in the rear.” He described their movement as “a saucer skipping across the water.” A local reporter fixated on “saucer” and the term “flying saucer” was born. But get this: The first modern report of a triangle UFO predates the Kenneth Arnold sighting by more than 10 years. 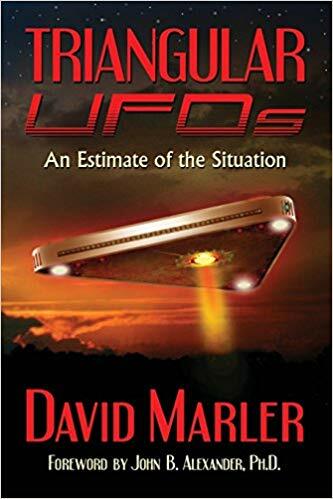 In the book I’m reviewing today, TRIANGULAR UFOS: AN ESTIMATE OF THE SITUATION, author DAVID MARLER tells us about two young men who encountered a giant flying triangular object while walking along a lonely, snow-covered road one night in Alaska. The year was 1936. As the gigantic object approached them, they became frightened and dived into the snowbanks on the side of the road to hide as the fantastic object passed by. Obviously, this obscure event on a remote rural road in Alaska did not create the sensation as did Kenneth Arnold’s sighting of nine triangle-disks skimming over the skies of Washington, and so usher in the modern UFO era. But it does demonstrate something important — that triangular flying objects have been appearing in our skies for many decades. That’s part of the reason why this book is an incredibly important contribution to the study of UFOs. Marler chooses to focus on triangular objects, but in doing so, he has made one of the best cases I’ve ever encountered for the idea that UFOs cannot be explained away as something natural or the product of human invention. The evidence is powerful and persuasive that airborne triangular objects are of nonhuman origin – be that entities from the stars, alternate dimensions, future timelines — or even something else. Marler doggedly hammers away at the issue with painstaking and relentless presentation of case after case of sightings mostly gleaned from local newspaper reports, but also from the files of those organizations with study the phenomenon, such as MUFON or the National UFO Reporting Center. Time and again, people from all walks of life tell of their experiences with sightings of gigantic triangular objects that float with utter silence in seeming complete disregard for the laws of gravity and physics. Many sightings report that the triangles travel with the widest side forward rather than “point forward” in weird contradiction of common-sense aerodynamics. There’s also high strangeness. For example, some reports tell of triangles that shape shift, split in two and reform or take on other forms. Some have rows of windows in which, occasionally, glimpses of occupants are seen. Then there’s the uncanny, gigantic size of the objects. In the case of the famous series of sighting in 1997 “Phoenix Lights” incident, one triangle is estimated to have been 7 to 9 miles long – and was seen by thousands of people. 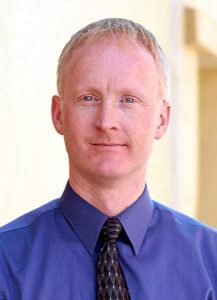 Darryl Barker created a 28-minute documentary on the Illinois events. Other cases involve thousands of witnesses as well. Another prominent sighting is the Tinley Park Triangle. Tinley Park is a fast-growing suburb of Chicago. In August of 2004 thousands of people looked up into the night sky to see three bright lights that formed a triangle. UFO investigators located at least 30 videos of the object captured by residents. Although no physical structure could be seen between the lights, video analysis by computer-video expert Terrence Masson and Dr. Ted Acworth indicate that the lights were attached to a solid structure that was about 1,500 feet long. 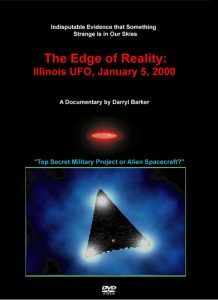 Early in the book Marler takes us with painstaking detail through the January 5, 2000, sightings of a triangular UFO that was seen and tracked by numerous witnesses, including five police officers, one of who managed to get a Polaroid picture, although of poor quality. Here Marler demonstrates his almost obsessive detail-oriented approach, relating every niggling instance in laying out the facts of the case. 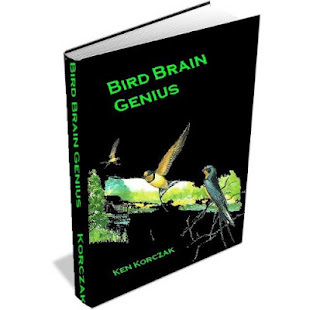 For example, he tells us where a police officer turned his squad car right and where he turned left as he followed the strange object as it traversed across southern Illinois skies. 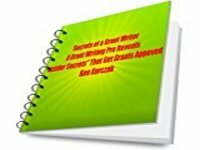 The effect for the reader is often tedious, and yet, instills us with the surety that here is a writer who is a serious, painstaking investigator that doesn’t mess around. I think anyone reading this book will be struck by the fact that the majority of it could never have been written if it had not been for the steady work of local newspaper reporters toiling away at small and medium-sized papers across the nation and world. Indeed, I was delighted to see that one of the historical accounts cited was gleaned from a Midwest daily newspaper I once worked for as a general assignment reporter back in the 1980s – The Daily Journal of Fergus Falls, Minnesota. I bring this up because I notice Marler’s book is published by RICHARD DOLAN Press. Mr. Dolan, of course, has been a premier voice in the UFO field for decades. His contribution to the understanding of legitimate, evidence and fact-based study of the issue has been beyond calculation. He has my endless admiration. However, where I part ways with Mr. Dolan has been his frequent excoriation of the media as “part of the problem” in terms of the frustrations within the UFO community about being accepted as a legitimate field of study. That’s why I was prompted recently to flay Mr. Dolan and his co-author Bryce Zabel in a scathing review of their book, A.D. AFTER DISCLOSURE. (See that review HERE). To be fair, I have sometimes heard Richard Dolan make it clear that he thinks local, or perhaps second-tier media outlets are doing a good job of reporting the UFO phenomenon, but he contends that the “nexus of control” occurs at the top-tier of the mainstream media level. He has frequently made the dubious (and demonstrably incorrect) claim that major news outlets are “controlled by the CIA” and other dark government influences. (Again, see his argument in A.D. After Disclosure). This is where the otherwise level-headed Richard Dolan tragically falls prey to full conspiracy theory mode psychology. This view is widespread among the UFO community. 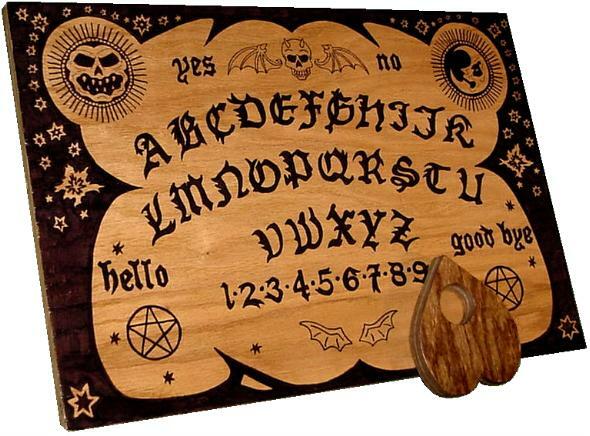 Most have accepted as gospel that the media has long played a nefarious, dishonest and corrupt role in not only keeping the truth about UFOs suppressed but but also acting as a proactive agent of outright disinformation. 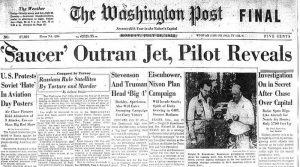 It was on-the-ground, hard working journalists who first revealed the UFO story to the public — and did not hide it from the public — and they continue to do it every day up to present day. David Marler’s book demonstrates that. The book is bolstered by forward written by the legendary JOHN B. ALEXANDER Ph.D. An afterward section provides short essays that offer more perspective. These include offerings by Richard Dolan, Mark Rodeghier, George Wingfield, Omar Fowler and Peter Davenport. This entry was posted in Uncategorized and tagged Aliens, Belgian Triangle UFO flap, David Marler, Illinois, Kenneth Arnold, media, MUFON, Peter Davenport, Phoenix Lights, Richard Dolan Press, Roswell, Tinley Park, Triangular UFO, ufology on April 8, 2019 by admin.